Picked fresh from the farm to bring summer's brilliant beauty straight to their door, the Endless Summer Sunflower Bouquet is ready to lift spirits and celebrate the fun of the warmer months ahead. Hand gathered in select floral farms and blooming with a vibrant sunlit yellow hue, this gorgeous flower arrangement has been picked fresh for you to send your warmest wishes to friends, family, and loved ones as a birthday, thank you, or get well gift. 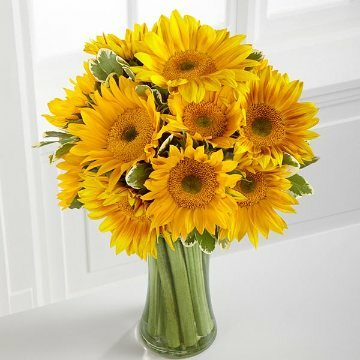 This bouquet includes the following: assorted sunflowers.